The Madsonian Museum of Industrial Design in Waitsfield, VT will soon open a two month exhibit called “Made in the Shade: The Designs of Summer Vacation”. The exhibit will feature vintage surfboards, swimsuits, canoes, boats, picnic sets, automobiles, and travel trailers. It opens September 16, 2012 with an indoor/outdoor event, featuring food and music as well as some of the cars, boats, and travel trailers that will be part of the exhibit. If you have a small trailer that you’d be willing to part with for the day (or for the two months of the exhibit) and are in the northeast part of the U.S., you can contact Mariah via email: mariahpastell@gmail.com. 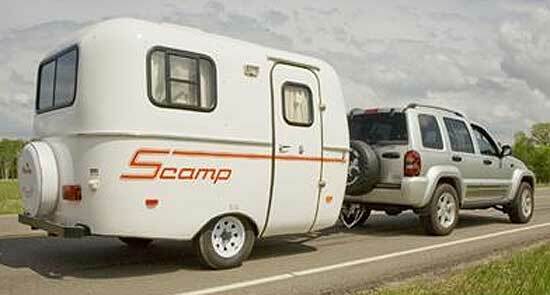 That foot traffic creates somewhat of an expense for Scamp, but in a good way, says Eveland. “We have so much traffic throughout the fair that we actually have to replace the carpet in the trailers! It gets matted down and looks like the carpet is about 30 years old!” It all points to the 41 year old family owned company’s prominent stake in the fiberglass travel trailer market. 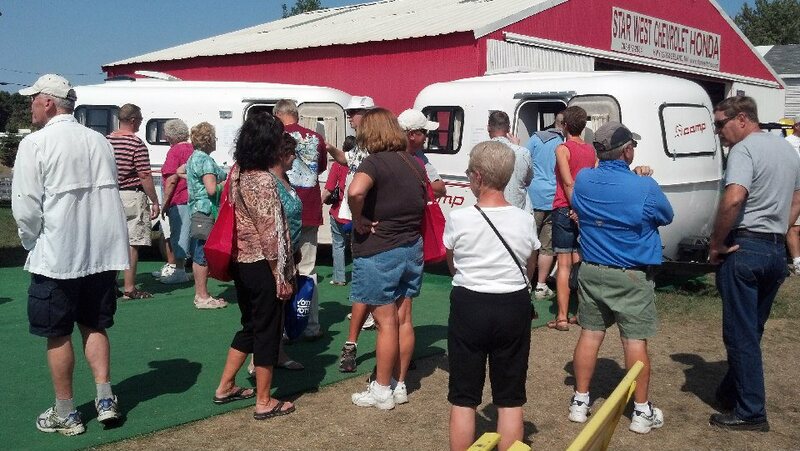 Scamp will have their display open daily at the fair through closing day, Monday, September 3. At the fair, they’re located on Underwood Street between Wright and Randall Avenues. Here’s a little walk-through video (without audio commentary) of the 2013 Serro Scotty Sportsman I had taken at the Big Little Rally earlier in August. I forgot I had taken this with my iPhone, so I put it up to give you an overall feel of the unit. Expect to see some changes with the next prototypes, as Bill Kerola had a lengthy punch list on this one. Back in February, I got an email from one of the readers of The Small Trailer Enthusiast, Ross Macintosh. 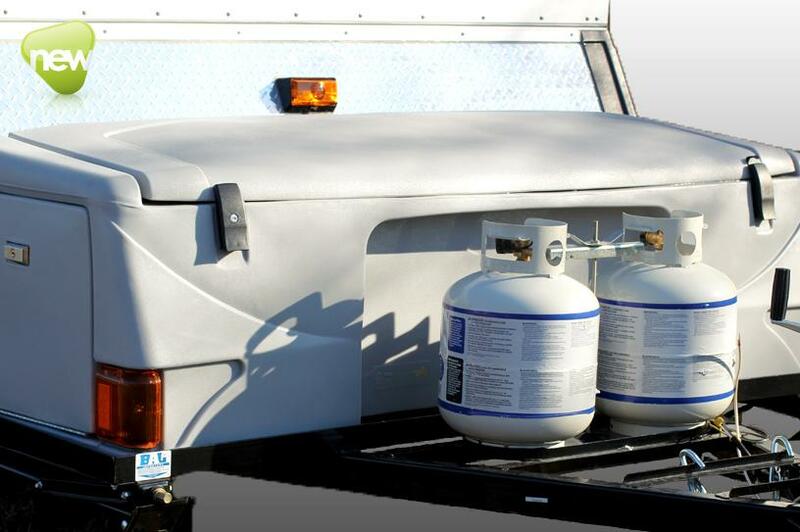 Ross was in the process of having a new CampLite trailer built by the guys at Livin’Lite. For those of you who’ve read my ramblings over the last year, you know that I’m very fond of CampLite and the products they build. When I read a post on The Small Trailer Enthusiast Facebook page from Ross a few weeks ago to let me know of his new blog, I was happy to hear his design tweaks during production were finalized and the unit was eventually ready for him in July. Check out Ross’ blog at http://designstop.com. 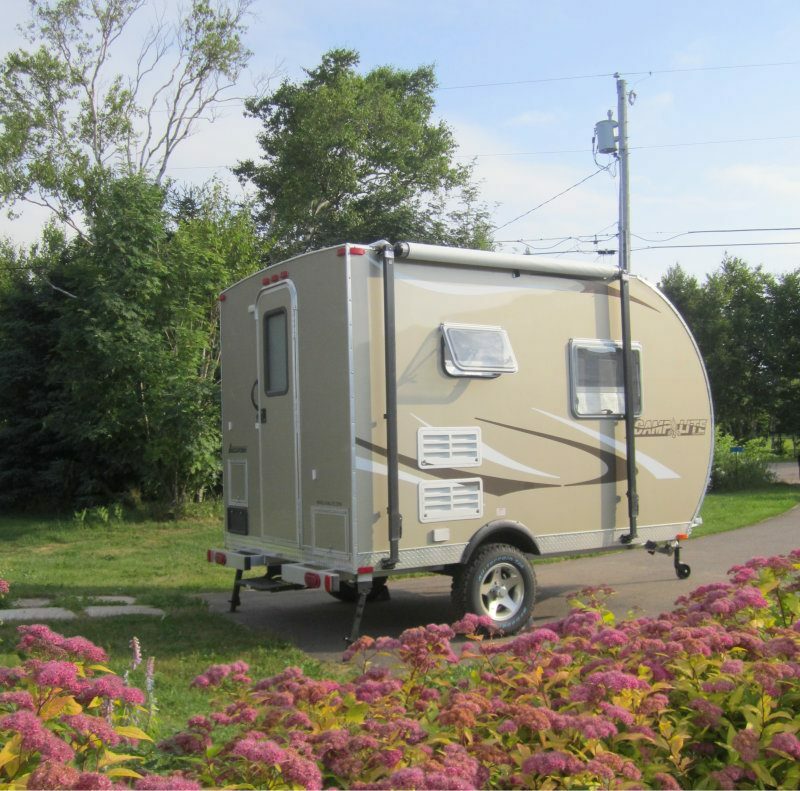 It’s relatively new, but he’s talked about the CampLite, trips, and other good, in-depth RV related posts. And while on the topic of blogs, be sure to check out the “Other Links” page on The Small Trailer Enthusiast. 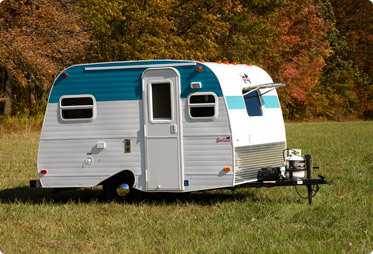 We’ve got a growing list of miscellaneous RV-related websites and blogs listed for your perusal. Recently Serro Scotty Worldwide introduced the 2013 Serro Scotty Sportsman prototype at various rallies. I had a chance to see it recently at the Big Little Rally in Transfer, PA, and many of you will see it for the first time here. Serro Scotty president Bill Kerola told me over the weekend there are a lot of things that will need to be tweaked with the next prototype. However, there’s no doubt the Sportsman has received an extreme makeover from the previous model that existed from the 2008-2010 model years. Some savvy Scotty devotees might notice at first glance it’s similar in styling to that of the now defunct Serro Scotty Pup, which lasted from 2009-2011. While the Pup (pictured below in the foreground) was smaller than the ’13 Sportsman, the design resembles that of the Pup more than that of the previous Sportsman. While the Serro Scotty website currently does not have any info on the ’13 Sportsman, one spec that I can share is it weighs in at an impressive 1700 lbs. Impressive in that it’s very lightweight for its size. The previous Sportsman checked in at a base weight of 2100 lbs. Kerola tells me there are many composites in the ’13 Sportsman. So many composites that it could probably pass as a “green” RV. Another attention-grabber is the skylight that stretches over the back of the trailer, above the gaucho sofa. Currently the prototype’s floorplan consist of a toilet and fridge in the front. However, another floorplan is being developed that will feature a dinette in the front and bed in the rear. I was impressed with the headroom as well. I’m a tick over 5’10”, and I’d guesstimate the headroom in the ’13 Sportsman to be around the 6’3″ range. Kerola tells me he’ll be sending out a press release in the next couple of months, so we should know more about this as well as what the production of the popular HiLander is looking like. The Sportsman is being produced by a group of former Coleman pop-up trailer employees in Somerset, PA. This weekend we’re on location at the 3rd Annual Big Little Rally in Transfer, PA. The rally is hosted by Kerola’s Camper Store and is a free rally for customers of Kerola’s, Serro Scotty owners, Aliner owners, and members of the various Tearjerkers chapters. There are expected to be around 65 trailers attend the event this weekend. I’ll be dropping a few notes through those two locations as the weekend goes by. The 2013 Serro Scotty Sportsman is here, so I’ll be giving you a few more looks of this prototype as well. Helping fuel the increase in sales is the new optional storage compartment. 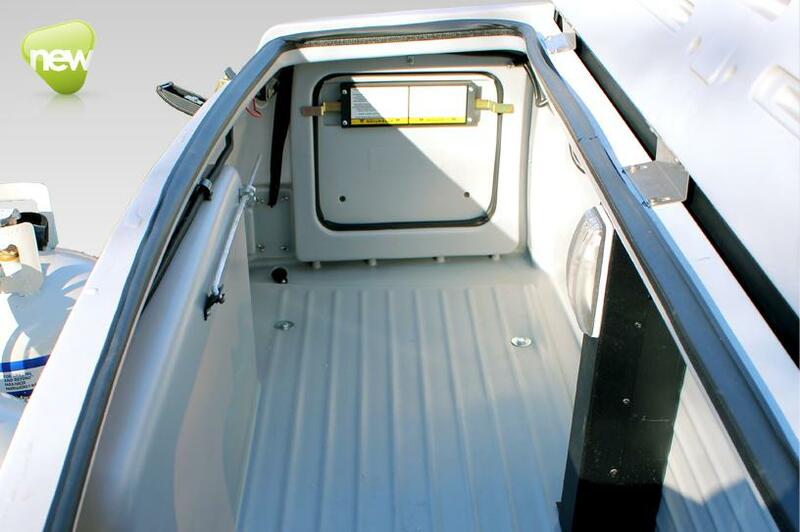 Located on the front tongue, the 100% waterproof, 30 cubic foot compartment features lockable full-length top and side access doors, as well as interior lighting. Better yet, the entire box is removable, leaving in its place a tray for transporting larger items. Competitors offer either a storage box or a tray, but not both. Removing the box takes less than 10 minutes. 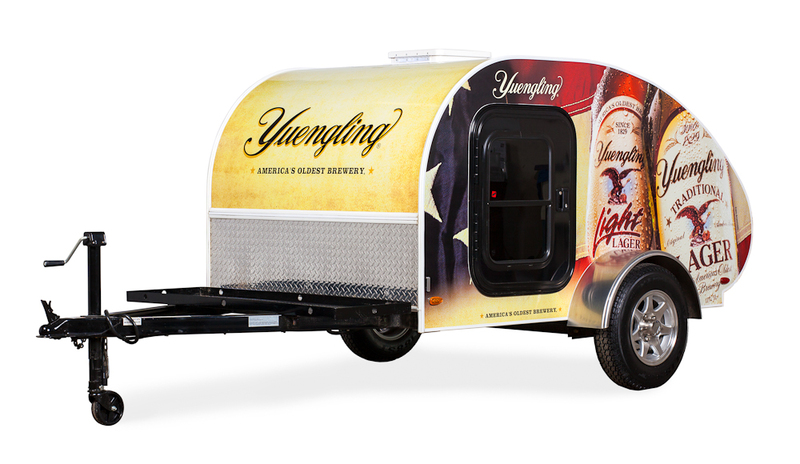 “As we became aware of the strong consumer demand for such a product, we decided that we could best utilize our technology to provide a cutting-edge option that is unique to the camper industry”, according to Aliner parent company Columbia Northwest CEO Ned Collins. 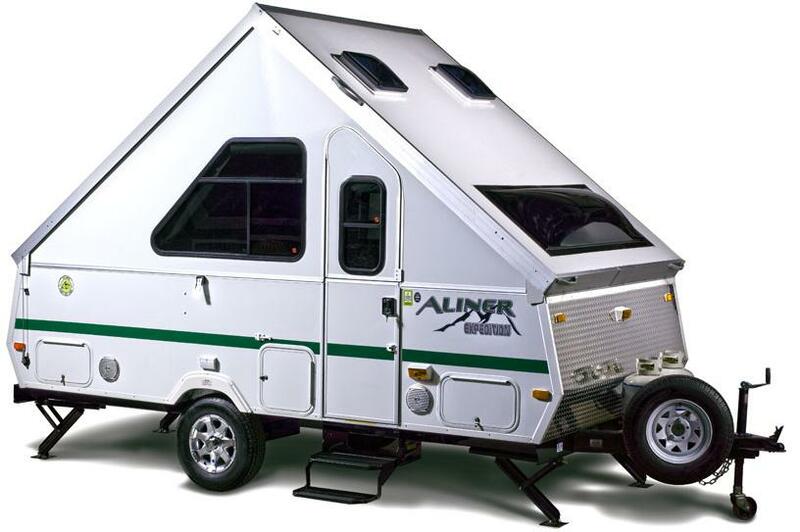 Aliner has always been synonymous with hard-roofed, pup-up campers. Most would say they’re the torch bearer for such a niche market. With innovations like the removable storage box, that claim is hard to dispute. Just a little bit of maintenance work to announce. I’ve gone with a new e-mail subscription widget for the site. This new e-mail notification widget will allow you to unsubscribe from receiving e-mail notifications, something the old widget doesn’t allow when you receive e-mail notifications when a new post on the site is published. The only downside is that I was not able to export the existing list of subscribers, so you’ll have to re-subscribe to continue to receive email notifications. Just enter your email on the right hand side of the main page (to the right of this post) and below the Amazon ad. Look for “Subscribe to Blog via Email”, enter your e-mail address and then you’ll be good to go. I’ve had a few people in the past who wanted to unsubscribe and couldn’t with the widget I was using, so this should alleviate that in the future.